Compatible with iPhone6 plus/6/5/5S, Samsung Galaxy S6 Edge/S6/S5, and other smart phones, and all cameras. Dimmable 14" LED SMD Ring Light with a wide dimming range from 1%-100%. More than 50000hrs service life. Compatible with iPhone6 plus/6/5/5S, Samsung Galaxy S6 Edge/S6/S5, and other smart phones, and all cameras. 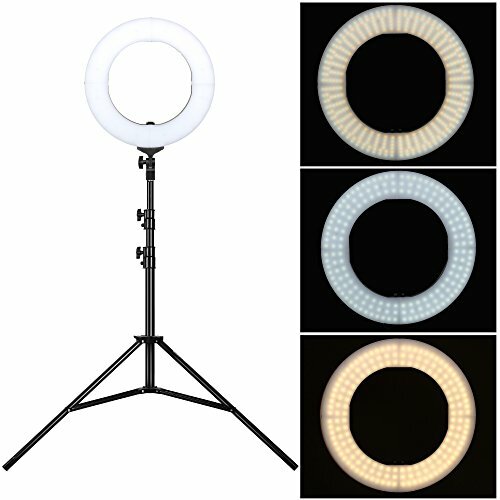 Large campatiable letting you have more choice in using the Led Ring Light, Choose one best suitable for you. Multi-scene use:Can be used for Self-timer beauty,Webcast like youtube,twitch can use this for Fill light,makeup modeling teaching Live lesson,Wedding photography fill light,Tattoo nail fill light,Hairdressing studio fill light,Product photo fill light and suitable for all all the need to fill the light of the environment. High Quality Material:Eye protection ABS lamp cover with Lamp beads make the light more natural, not dazzling,improve the item three-dimensional. If you have any questions about this product by ZoMei, contact us by completing and submitting the form below. If you are looking for a specif part number, please include it with your message.